RuthAnn and I just completed our first organized ride this spring on our Catrikes. She rides and likes her Villager and I have the 700. Together we have been riding recumbents for not almost five years. We both started out with other manufacturers and my first was a two wheel recumbent. As we became more proficient appreciating the advantages of recumbent pedaling we realized both our �bents� needed to be upgraded. Research on the web lead us to Catrikes and Ashley�s shop in Payson. We both are absolutely satisfied with all aspects of our decisions and enjoy riding together. Presently, we are training for another fundraiser, the NorCal Aids Cycle which will be 330 miles in four days. I have written previously on that ride in 2013. Saturday April 20th we had brought our trikes to Yuba City California to ride around the Buttes. This is a fundraiser for diabetes care in the community and was begun 28 years ago. The Buttes are very old volcanic peaks of less than 2200 feet above sea level. 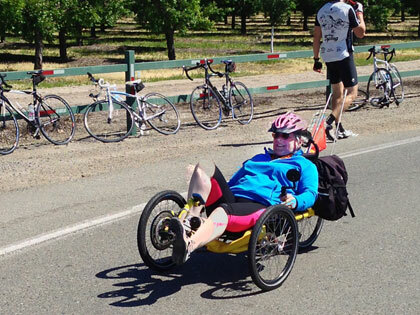 Circumnavigating the Buttes is a 40 mile easy ride, both scenic and exhilarating in the northern Sacramento Valley. At one time the Buttes looked over liquid fueled rockets buried in silos during the cold war of the early �60�s. Anciently, before the arrival of Europeans a number of Indian tribes worshipped and held the mountains to be have special significance. Jokingly, they are also known as the world�s smallest mountain range. Tourism or hiking on the Buttes is restricted and most of the land is in private hands. Saturday�s ride was something we were very much looking forward to, for one the midday temperature was to be about 85�F, a nice change from cool and rainy Utah. The ride is easy and few serious challenges in terms of hill climbing. We noted less than a 1000 feet elevation change in our accumulated circumnavigation. Not surprising to us in our experience this time of year are the head winds we encountered. There were audible moans and comments about the winds. The good news riding to the finish we would have strong tail winds. We were very pleased with the recumbent Catrikes. Everywhere we go we are asked questions about them, especially from the more senior riders we encounter. We are peppered with questions as they generate a good deal of curiosity wherever we ride them. The Schlumpf High Speed Drive as well as the Rohloff internal geared rear hub brought a few questions more from those who know about eliminating derailleurs. The investment for these quality components is serious but I have no regrets. 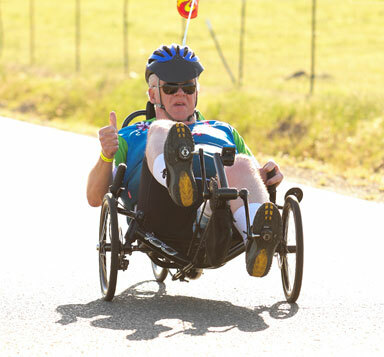 We wanted to share with you and anyone thinking about taking up recumbent riding a few of our perspectives and what we enjoy so much about them. In order of priorities we both clearly would say recumbent trikes are the most comfortable pedaled machines on any trail or highway anywhere. Previously I had owned both high-end mountain and street bikes, even a custom-made road bike. Due to arthritis in the neck and wrists I had to retire from riding them. The recumbent Catrike has allowed me to renew the joys of pedaling a cycle around Davis County and other locales. RuthAnn agrees and also suggests balance is important to her. She has not fears of falling regardless of the speed she goes. Third, as was proved again Saturday in 17-25 mph headwinds we had at least a one gear advantage if not two over any traditional bicycle. In our senior years we were passing almost everything on the rode except the young athletic club riders. With the gusts of wind we were stable. Normally, pedaling downhill is not necessary but going down Pass Road the stability of the Catrikes allowed us to discount the wind gusts. I hit over 30 mph coming off while the traditional bikes were managing 20 to 25 mph. Low to the ground trikes take a knock about visibility, we are asked if we have any issues about being seen from automobile drivers. We use flags, light and we have discovered most drivers are struck and interested in what we ride and watch us fairly closely. The driver will usually point us out to any passengers in his or her car. With regard to safety I have made descents on a skinny tired road bike and once running over a reflector in the middle of the Avenue of the Giants in Northern CA it nearly sent me into a patch of brush and a stand of redwood trees. With the stability of a trike, having three contact points hitting a rock, an obstacle, or having a blowout is never a safety concern. Riding over gravel on country roads in rural Utah or anywhere else equally is never a problem. Lastly, I suppose the real joy of handling, turning much more sharply and quickly just makes them fun to pedal and ride. All the time we are doing this there is no arthritis pain, no saddle sores, no need for chamois butter to spread on during breaks on centuries. If you want to leave the comfort of a recliner and being a couch potato, take a Catrike for a spin. One final note would be to suggest how well RuthAnn does on her Villager compared to the 700 racing machine. It is a most respectable machine and the differences between the two in flat out speed, between us, are not significant to prevent us from enjoying our rides together. I go further and faster but we end up at the same place each time. Any issues we have had with the trikes in maintenance, installations and adjustments have been handled very well by everyone at Utah Trikes. We cannot say enough about much we enjoy our trikes and appreciated working with Utah Trikes. This article was written by George Fisher, one of our customers. If you would like to submit an article to us please email us.